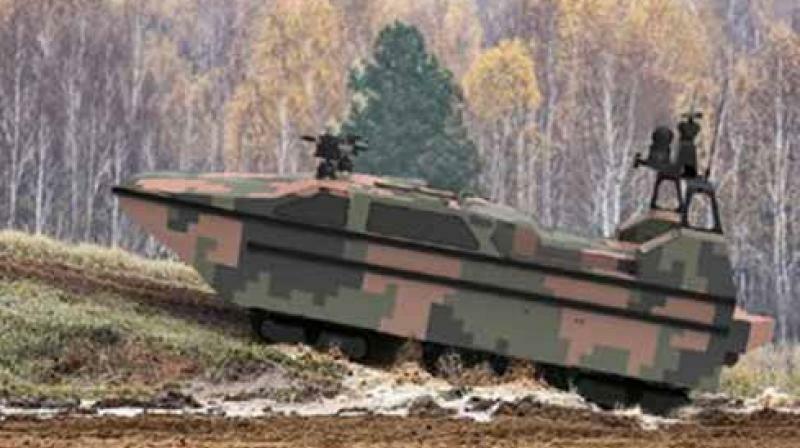 Having a maximum operation range of 1,200 kms, the Marine Lizard can be remotely controlled via satellites, an official said. In ship form, the 12-meter-long Marine Lizard is a trimaran propelled by a diesel-powered hydrojet and can reach a maximum speed of 50 knots while maintaining stealth, it said. When approaching land, the amphibious drone ship can release four continuous track units hidden under its belly, and travel at 20 kms an hour on land, the daily report quoted an unnamed official as saying. The official said the maximum land speed can be increased if larger track units are installed. The Marine Lizard's payloads include an electro-optical system and a radar system. In the weapon department, it is equipped with two machine guns and a vertical launching system for anti-ship and anti-aircraft missiles, the official said. It can autonomously sail, avoid obstacles and plan routes, he said. The company manager said it can remain dormant on an uninhabited island for up to eight months before engaging in combat once it receives orders, the report said. Guided by China's BeiDou Navigation Satellite System, the Marine Lizard can cooperate with other battle units in an integrated command system, the official said.